Dragons World: Dragon Stats and Pictures! Grass Dragons are used to living in green meadows, so the color of their skin has come to resemble lush meadow grass They are fast runners, but can't fly very high. They love basking in the sun. Grass Dragons have a quiet, gentle temperament and enjoy the company of other dragons. How to Breed Grass Dragon? 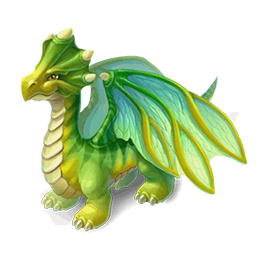 Find out how to breed Grass dragon with the How to Breed Calculator!